Separates and protects fragile items within a box. Available in a variety of board types. 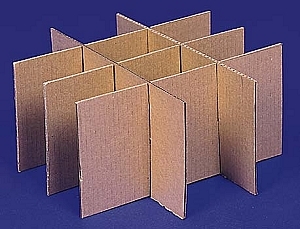 Plain chipboard - the most economical grade for basic separation and protection. Corrugated partitions - can be manufactured from "E" flute to Double Wall. Wax-impregnated chipboard - cleaner and less abrasive to products as it provides a smoother surface. Polyethylene Coated SBS - the least abrasive surface of any paperboard and provides maximum resistance to oil and grease. Anti-tarnish paperboard - low sulfur reducing corrosivity. Increases the stacking strength of the container. Custom designs and colors our specialty. We offer: Top and Bottom locked, Center Locked, Friction Locked, Y entry, Q-Lock, Corner Locks, V-Notching, Embossing and Holes.